Artist Mike Queenz. Photo by Ryan Stopera. Volume I of a collaborative series with the Twin Cities Daily Planet dedicated to the legacy of Prince, featuring artist Mike Queenz. The Prince Legacy Project is a three-part video series featuring original works by black Minnesota artists inspired by the life of Prince. To learn more about this project, check out the forward by Caroline Taiwo here. Community elders gave Resmaa Menakem his name approximately 20 years ago and merely a decade after he began his path as a mental health therapist. His name reflects his calling as a healer with Resmaa meaning “to cause to rise in the alignment of truth” and Menakem meaning “using the foundation of his people” in the Kemetic language. The Twin Cities Daily Planet's Prince Legacy Project features local black artists inspired by the life and music of Minneapolis' own Prince Rogers Nelson. In Vol. 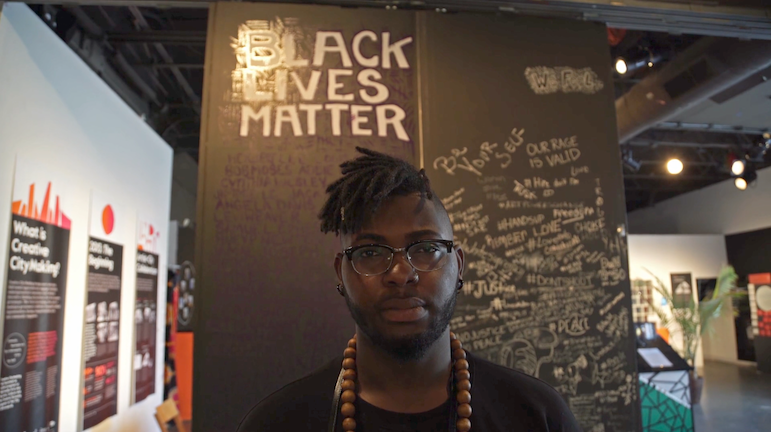 II, artist organizer Chaka Mkali, AKA I Self Devine, shares a painting rooted–as Prince was–in Minneapolis. "There's often a conversation of Prince transcending race... but when you say it in that fashion it's as if we don't have to have that conversation around gender, race or class–what defined him, especially coming from a place like Minneapolis, that is typically eurocentric. To be who he was is like salmon swimming upstream, and is the result is the environment he created. His own universe," Mkali said.